Imogen's Typewriter. 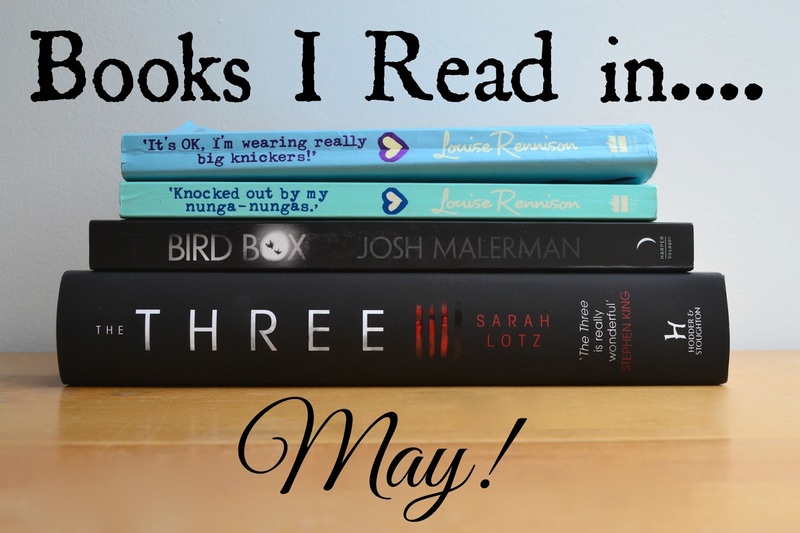 : Fiction Friday: Books I Read in May! Oh May. With my assignment deadline, I didn't read as much as I thought I would but I did start doing full reviews of books which is a lot of fun. I stuck to two completely contrasting genres this month; horror/thriller and teen chick-lit, my tastes are flawless! I read the first of the Georgia Nicolson books in March and enjoyed it. Just like that one I found myself laughing out loud at this book and picked the next one up right after finishing it. The plot is a little lacking but the characters are hilarious. This series is constantly putting a smile on my face. It was a little shorter than the other books but the plot picked up as Georgia deals with having a boyfriend. There was a lot of, as she would say, 'dramatosity.' I keep rating these books three stars but I do like them. I explain my stars system here! I did a full review of this here and you have a week till my giveaway of a copy ends. I've read a couple of thriller type books already this year like Lexicon and Unravelling Oliver but this was the first thriller thriller and I really enjoyed it. It made me want to write some creepy stories. I did a full review of this book too here! This was one of the best books I've read this year. Of the eighteen books I've read, this is one of three (heh) books that have got ✮✮✮✮✮ and it honestly deserves it. My mum has actually taken this off me to read even though she hates planes and she likes it so far. Read it. If I don't get along with a book then I pause it, like Insurgent. This month we had another one. Shatter Me by Tahereh Mafi . You may remember this from my Buddy Read announcement here where I was so excited to be reading this along with Lianne. Well. That clearly didn't happen. Let me start by saying that I don't really like being mean about books, I'm an attempting writer so I understand the effort and time and heart that goes into writing a book. I can be negative, but only if I feel I have a really valid reason. But this book was just hard to read. I can see what Tahereh Mafi was doing and I can understand why but the abundance of similes and metaphors and all round purple prose... I just couldn't. To the paused shelf it goes. *These books were provided by the publisher for review. It has not changed my opinion.